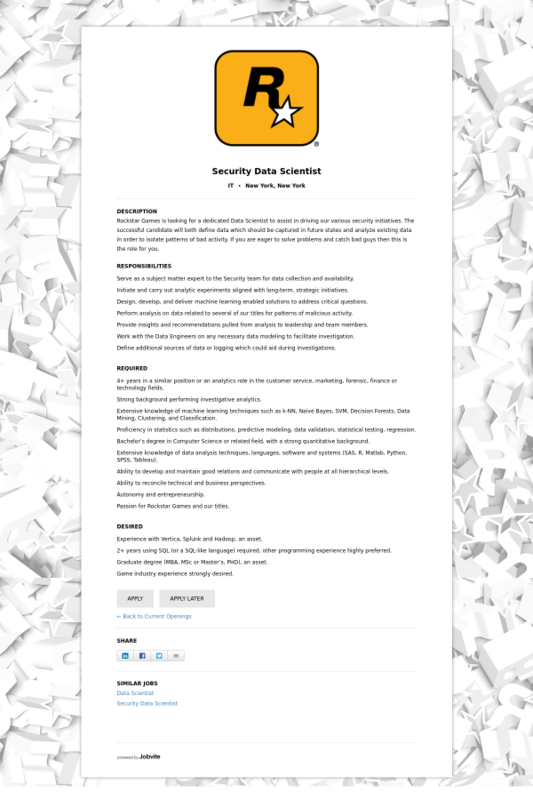 Rockstar Games is looking for a dedicated Data Scientist to assist in driving our various security initiatives. The successful candidate will both define data which should be captured in future states and analyze existing data in order to isolate patterns of bad activity. If you are eager to solve problems and catch bad guys then this is the role for you. Serve as a subject matter expert to the Security team for data collection and availability. Initiate and carry out analytic experiments aligned with long-term, strategic initiatives. Design, develop, and deliver machine learning enabled solutions to address critical questions. Perform analysis on data related to several of our titles for patterns of malicious activity. Provide insights and recommendations pulled from analysis to leadership and team members. Work with the Data Engineers on any necessary data modeling to facilitate investigation. Define additional sources of data or logging which could aid during investigations. 4+ years in a similar position or an analytics role in the customer service, marketing, forensic, finance or technology fields. Strong background performing investigative analytics. Extensive knowledge of machine learning techniques such as k-NN, Naive Bayes, SVM, Decision Forests, Data Mining, Clustering, and Classification. Proficiency in statistics such as distributions, predictive modeling, data validation, statistical testing, regression. Bachelor’s degree in Computer Science or related field, with a strong quantitative background. Extensive knowledge of data analysis techniques, languages, software and systems (SAS, R, Matlab, Python, SPSS, Tableau). Passion for Rockstar Games and our titles. Experience with Vertica, Splunk and Hadoop, an asset. 2+ years using SQL (or a SQL-like language) required, other programming experience highly preferred. Graduate degree (MBA, MSc or Master’s, PHD), an asset. Game industry experience strongly desired.